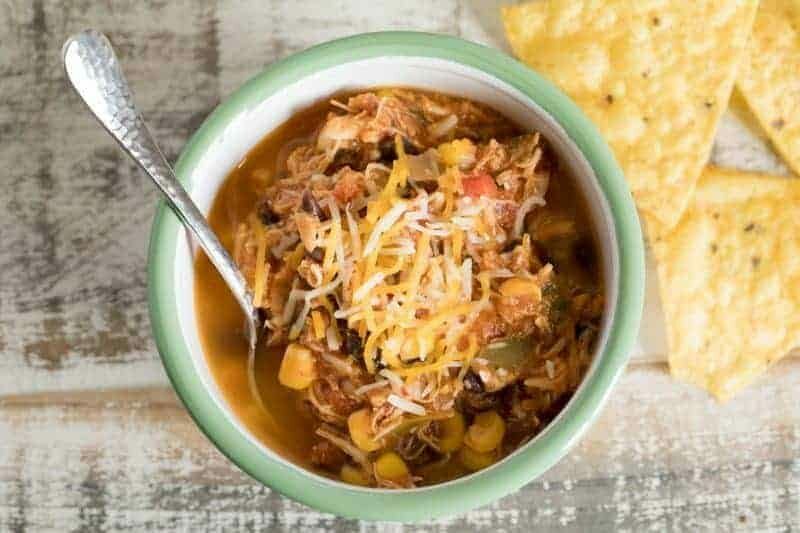 This Instant Pot / Pressure Cooker Spicy Chicken Soup is a quick-to-throw-together chicken taco soup and loaded with chicken, black beans, corn, tomatoes, and salsa. Top it with your favorite Mexican cheese, sour cream, crushed tortilla chips, and a jalapeno or two. This Instant Pot / Pressure Cooker Spicy Chicken Soup has been one of my family’s favorite soups for a long time. The original slow cooker recipe was one of the first recipes I posted on my baking blog, Barbara Bakes. I used to have to remember to start it in the morning so it’d be ready for dinner. However, since I converted it to a pressure cooker recipe, I’ll spend 5 minutes in the kitchen and come back to a fully cooked soup in under an hour. This is the perfect meal for a busy night! If you like a little spice in your life, give this one a try. An Instant Pot is one of the most popular brands of electric pressure cookers. 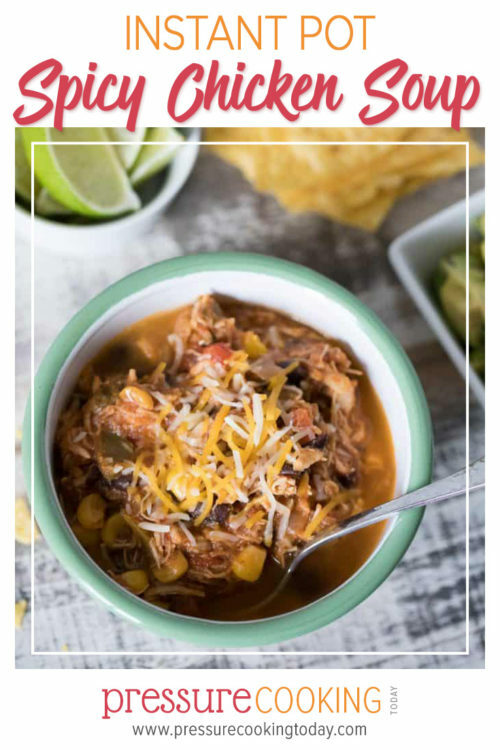 They are easy to use and your Instant Pot can help you create this delicious Pressure Cooker Spicy Chicken Soup! This can be a great dump-and-go recipe. When you’re really in a hurry, you don’t even have to defrost the chicken. Just use frozen chicken breasts and increase the cook time to 11 minutes! This is a really flexible recipe. Don’t be afraid to use it as a template to branch out a little. Don’t have salsa on hand? Substitute a similar amount of your favorite salsa ingredients, Rotel diced tomatoes, or add cumin or red pepper flakes another favorite flavor. (One Pressure Cooking Today reader substituted chipotle in adobo puree with great results!) If there’s a Mexican flavor you love, give it a try! My daughter, Jennifer, only had a small crockpot when she was first married, so she had to cut back on the chicken and the black beans to get the whole soup to fit. Even though she now has an Instant Pot that can fit all the ingredients, she prefers to still leave out the chicken and beans to get the more broth-y soup she’s used to with less chicken and beans. I’ve included her modifications in the recipe notes as well. I love this Pressure Cooker Spicy Chicken Soup because it makes about 5 quarts of soup, so there’s almost always extra. This soup freezes and reheats really well. I like to freeze it in individual servings, about 1 1/2 cups, in freezer Ziploc bags. Stack the bags flat on a cutting board or rimmed baking sheet before putting into the freezer. Once frozen, you can stand them up to take up less room in the freezer. Are soups on a regular rotation at your house during the winter? Do you have a favorite soup you’d like me to make? Let me know in the comments! Select Sauté and add olive oil to the pressure cooker pot. When oil is hot, add the onion and cook, stirring occasionally until the onion is tender, about 5 minutes. Add the garlic and cook for an additional minute. When the cook time ends, turn off pressure cooker. Allow the pressure to release naturally for 10 minutes, then use a quick pressure release. Remove chicken breasts from the pressure cooking pot and dice or shred. Return chicken to the soup and stir in black beans and corn. If necessary, select Saute and bring the soup to a boil, stirring occasionally, until beans and corn are heated. Serve topped with shredded cheese, sour cream, tortilla strips, and jalapeno peppers, if desired. *This recipe is very forgiving. If you want a true dump-and-go meal, substitute 2 tablespoons dried onion and 1 teaspoon dried minced garlic. Skip the first step and just add all the ingredients (except corn and beans) to the pressure cooking pot. *Customize the amount of chicken and beans to your family's tastes. The chicken breasts absorb a bit of the broth as the soup cools, so if you add the full amount of chicken breasts, you'll have a thick, hearty soup. With less chicken, the broth and beans take center stage. **You can cook boneless, skinless chicken breasts from frozen in this recipe, just adjust the cook time to 11 minutes. Another winner Barbara! I added some low fat cream cheese before beans and corn, just fabulous. My mom and two sisters are now hooked on your recipes as well (I made cheesecakes and potato soup for them in my instapot). Just got your recipe book and can’t wait to try more recipes. That’s awesome! Thanks so much Jill. Hi Michele – I’d cook it for 10 minutes with chicken thighs. Enjoy! ” what exactly does this mean, two cans each of 14.5 ounces, or total of 14.5 ounces? Thank you! Apparently your instructions are for a different type of pressure cooker than what I have. Mine is a stove top and doesn’t “beep” etc. Could you please direct me to instructions for these great-sounding recipes for my equipment? 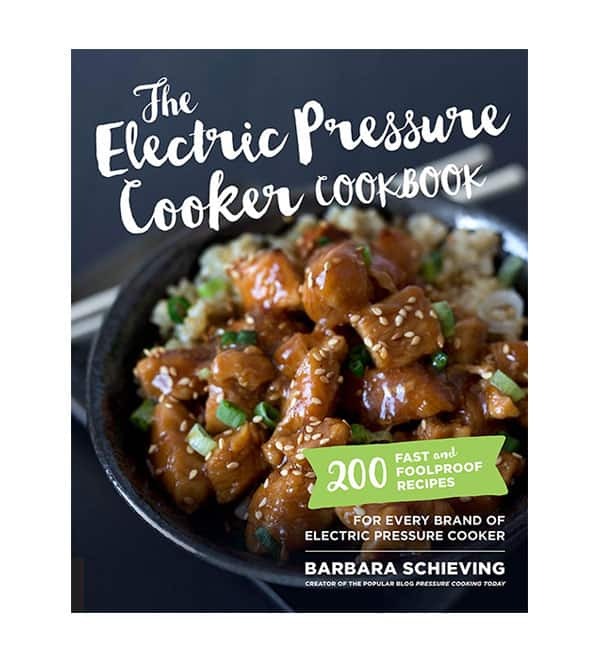 Hi Jean – yes, my recipes are written for electric pressure cookers. Converting to a stove top recipe is easy. Just bring your pressure cooker to high pressure the way you normally would, then set your timer when it’s at pressure and when the timer beeps following the recipe for a quick or natural pressure release. Salsa is a condiment, using a whole jar of a prepared condiment seems to defeat the purpose of home cooking ( not to mention costly).Couldn’t you add natural ingredients instead? When i cook i like to use as few prepared foods as possible.Since a pressure cooker really cuts cooking time adding prepared foods seems to be counter productive. 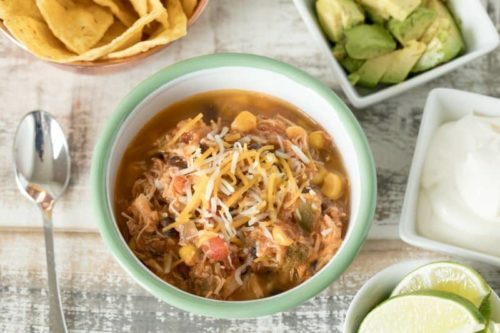 Hi Cameron – sometimes a shortcut like using prepared salsa is just the shortcut people need to make a homemade soup and not make a fast food run. Many people who buy a pressure cooker do so because they’ve seen one on TV that says you can throw frozen chicken in the pressure cooker with a prepared sauce for a quick, easy meal. I don’t believe one method or the other is the right way to cook. Everyone needs to do what works best for them. Sometimes I cook everything from scratch and sometimes I don’t. Definitely adapt recipes to suit your tastes. Add your favorite salsa ingredients to the soup instead of the salsa if that works better for you. 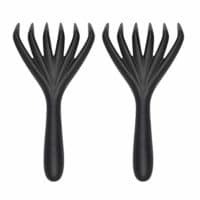 If I wanted to use dried black beans instead of canned, how would you suggest I adjust the cook times? Hi Connie – the cook time is longer for black beans so you’d probably want to cook them first and then make the soup. Here’s a recipe that you could simplify for the beans http://www.pressurecookingtoday.com/pressure-cooker-spicy-black-beans-and-hearty-greens/. You could cook a big pot of beans and freeze them in 1.5 cup portions (equivalent to a 15 ounce can) http://www.seriouseats.com/2014/04/is-there-a-ratio-for-converting-between-dried.html. Accidentally put the corn and beans into the pot along with all the other ingredients. What is the reason the recipe says to put those in after the chicken is cooked? Hi Leslie – the corn and the beans just need to be heat, so there’s no need to pressure cook them. However, if you find it’s easier to add them before cooking, that’s not a problem either. Just made this and it was great and super easy! I had to sub rotel for salsa due to what I had. Great recipe! Sounds like a great improvisation 🙂 I’m so glad it was a hit. And yeah for leftovers! It was a huge hit although my teenager will probably find it too spicy for him. LOL I was wishing my avocados were ripe to add some to it but not ripe yet. Hoping to make the Meyer lemon cheesecake this weekend! I’ve only had my Instant Pot since April and I do not know how I lived without one until now! And I love mine so much that my older sister ordered herself one too and I shared your site with her! It’s awesome!!! Thanks so much for sharing your love from pressure cooking and my site with your sister. I’m so glad the soup was a hit! Avocado and sour cream are great ways to cool the soup down a bit if it is a little too spicy for him. Thanks! Yeah, my teenager cannot handle even mild salsa. LOL It must be his German side! I cannot wait to try more of your recipes! My sister loves your site too and everything has such great flavor but simple recipes that do not require a trip to the market for ingredients. Most everything is stuff that is already in my pantry and those are the recipes we love! Nothing too exotic and homemade goodness! Hi Duane – so glad you enjoyed it. 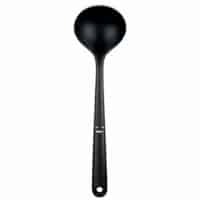 A perfect pick for your first soup. Hi Barbara! I am so happy you are the pressure cooking expert. I emailed you a long while ago about it but just received my pressure cooker today (took a while to decide whether I should really buy one!). I’m making this spicy chicken soup tomorrow. 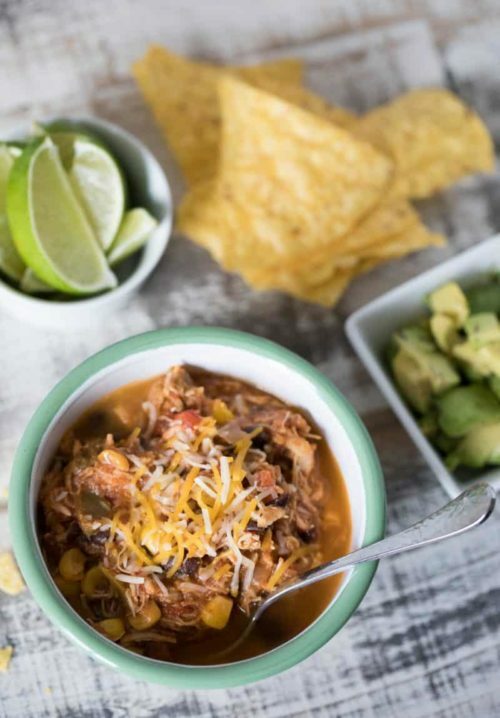 Can’t wait…plus I just pinned about a million of your other pressure cooker recipes! Hi Mel – so glad you made the leap. Let me know how you enjoy the soup. Have fun! I made this for lunch today using 4 frozen-solid chicken breasts. It is fabulous! This is my new favorite soup recipe. Thanks! So glad you enjoyed it. It’s so nice to be able to use frozen chicken breasts and still have soup ready to eat so quickly. It’s a favorite at our house too. This looks like the perfect thing for tonight. I have all the ingredients! This looks mighty tasty!! Anything with the word spicy in the title catches my attention! With another weekend snowstorm coming in, this looks like the perfect bowl of deliciousness to make…..it will warm us up after all that blasted shoveling! I’m so tired of snow. I hope spring comes soon. Enjoy the soup! Oh, yum!!! I’m totally trying this soup! Thanks Deon – please let me know how you like it.